It aims at supporting Thai students under the age of 35 who intend to study in French universities or Higher Education Institutions, at Master’s degree or PhD level. This call for applications is open to all fields of studies. Launch of the 2017 Franco-Thai Scholarship Program: October 2016. 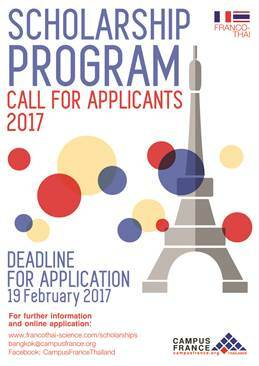 Preparation workshops by Campus France: October 2016 through February 2017. Scholarship laureates will be contacted individually. Final results will be published online on the Franco-Thai Scholarship Program website by mid-April 2017. Committee’s deliberations are beyond dispute.